The Volunteers Plate 2 from the cycle War. An exhibition of 40 prints and drawings by the German artist Käthe Kollwitz (1867-1945) will be shown in the National Gallery of Ireland. It is an opportunity for visitors to discover this important artist who created almost 300 prints, around 20 sculptures and some 1450 drawings during her long career. The works in the exhibition, specially selected by the Gallery from the superb collection at the Staatsgalerie Stuttgart, will allow visitors to reflect on the effects of war, in particular the grief left in its wake. and Death (1934-37) place her among the foremost printmakers of the twentieth century. The exhibition will be accompanied by a free illustrated brochure, and a programme of talks and music. Never Again War! 1924. Lithograph with text on dark tan poster paper. 37" x 27" (94 x 68.6 cm). Knesebeck 205/IIIb. Daniel Stoll and Sibylle von Heydebrand Collection. 1897. Lithograph on yellow chine collé, mounted on heavy white wove paper. Signed, lower right. 6 1/8" x 6 1/8" (15.4 x 15.4 cm). Plate 1 from the cycle Revolt of the Weavers. Printed prior to 1907, before the edition of 50 numbered impressions published in 1918. Knesebeck 33/AIIIa. Before 1897. Wash and ink on heavy ivory wove paper Signed, center right. 23 1/4" x 17 1/2" (59.1 x 44.5 cm). Study for the etching of the same title (Knesebeck 37) from the cycle Revolt of the Weavers. Nagel/Timm 135. Private collection. 1983-97. Etching on ivory wove paper. Signed, lower right; signed by O. Felsing, and numbered 11/50, lower left. 9 3/8" x 11 5/8" (23.8 x 29.5 cm). Plate 5 from the cycle Revolt of the Weavers. From the edition of 50 numbered impressions published in 1918. Knesebeck 37/IIc. 1903. Etching on heavy wove paper. Signed, lower left. 20" x 23 3/8" (50.8 x 59.4 cm). Plate 5 from the cycle Peasant War. From the first edition of approximately 300 impressions published in 1908. Knesebeck 70/VIIIb. Daniel Stoll and Sibylle von Heydebrand Collection. 1903. Lithograph in two colors on heavy cream wove paper. 13 7/8" x 9 3/4" (35.2 x 24.6 cm). Impression from the regular edition, with printed text in the lower margin. Knesebeck 75/AIIIb. 1905. Etching on wove paper. Signed, also by O. Felsing, lower left. 11 3/4" x 11 3/4" (29.8 x 29.8 cm). Plate 3 from the sycle Peasant War. Proof before any edition. Knesebeck 88/V. Daniel Stoll and Sibylle von Heydebrand Collection. 1907. Etching on heavy white wove paper. Signed, lower right. 16 1/8" x 19 7/8" (41 x 50.5 cm). Plate 6 from the cycle Peasant War. From the first edition of approximately 300 impressions published in 1908. Knesebeck 100/Xb. 1907-08. Etching on heavy wove paper. Signed, lower left. 12 1/8" x 20 3/4" (30.8 x 52.7 cm). Plate 2 from the cycle Peasant War. From the edition of approximately 300 impressions published in 1908. Knesbeck 101/Vb. Daniel Stoll and Sibylle von Heydebrand Collection. 1908. Charocal on white Ingres paper. Signed, upper right. 18 1/4" x 23" (46.4 x 58.4 cm). Study for plate 7 from the cycle Peasant War (Knesebeck 102). Nagel/Timm 429. Private collection. 1908. Etching on Japan paper. Signed, lower right, and by O. Felsing, lower left. 12 7/8" x 16 7/8" (32.7 x 42.9 cm). Plate 7 from the cycle Peasant War. Fromt the edtiion published by von der Becke in 1931-41. Knesebeck 102/IXa. Daniel Stoll and Sibylle von Heydebrand Collection. 1909. Etching on heavy cream wove paper. Signed, lower right, and signed by O. Felsing, lower left. 15 5/8" x 20 3/4" (39.7 x 52.7 cm). Proof before the numbered edition published in 1918. Knesebeck 104/VIc. 1910. Etching on heavy cream wove paper. Signed, lower right. 14 7/8" x 9 3/8" (37.7 x 23.6 cm). From the edition published in 1921. Knesebeck 111/V. 1910. Etching on heavy cream wove paper. Signed, lower right, and by O. Felsing, lower left. 13" x 9 7/8" (32.9 x 25.1 cm). Knesebeck 112/IVc. 1919. Lithograph with text on heavy dark beige paper. 26 3/4" x 36 1/8" (67.9 x 91.8 cm). Knesebeck 139/II. Daniel Stoll and Sibylle von Heydebrand Collection. 1919. Lithograph on smooth paper. Signed, lower right. 14 1/8" x 11 3/4" (35.9 x 29.8 cm). One of three recorded impressions. Knesebeck 144. Private collection. 1921. Lithograph with text on tan poster paper. 26" x 18 3/4" (66 x 47.6 cm). Knesbeck 170/AII. Daniel Stoll and Sibylle von Heydebrand Collection. 1921-22. Woodcut on heavy white Japan paper. Signed, lower right, and numbered 63/100, lower left. 13 3/4" x 19 1/2" (34.9 x 49.5 cm). Plate 2 from the cycle War. From the edition of 100 impressions on this paper. Knesebeck 173/IVb. Private collection. 1922-23. Woodcut on heavy cream wove paper. 14 5/8" x 8 7/8" (37.1 x 22.5 cm). Plate 4 from the cycle War. From the edition of 100 impressions printed on the cover of the "A" edition of the portfolio. 1922. Woodcut on heavy cream wove paper. Signed, lower right, and numbered "B 4/100," lower left. 14 5/8" x 15 7/8" (37.1 x 40.3 cm). Plate 1 from the cycle War. From the edition of 100 impressions on this paper. Knesebeck 179/IXc. 1923. Woodcut on thick, soft, textured off-white paper. Signed, lower right. 8 3/4" x 9" (22 x 22.8 cm). One of approximately 20 impressions. Knesebeck 182/VI. 1923. Charcoal on gray wove paper. Signed, lower right. 19 3/8" x 25 1/2" (49.5 x 64.8 cm). Study for the lithograph of the same title (Knesebeck 197). Nagel/Timm 985. Private collection. 1923. Lithograph with text on thin tan poster paper. 18 1/2" x 17 1/8" (47 x 43.5 cm). Knesebeck 198/II. Daniel Stoll and Sibylle von Heydebrand Collection. 1923. Lithograph on heavy cream wove paper. Signed, upper right. 16 3/4" x 11 3/8" (42.5 x 28.9 cm). Impression from the edition published by Richter. Knesbeck 202/AIVa2. 1924. Lithograph with text on dark tan poster paper. 13 3/4" x 18" (34.9 x 45.7 cm). Knesbeck 206/AII. Daniel Stoll and Sibylle von Heydebrand Collection. Unemployed 1925. Woodcut, worked over in India ink and white tempera, on heavy soft textured Japan paper. Signed, lower right, and inscribed "I.Z" (1st s[tate]), lower left. 14 1/8" x 11 3/4" (35.9 x 29.8 cm). Plate 1 from the cycle Proletariat. Unique proof. Knesebeck 215/I. Private collection. 1925. Lithograph on soft cream Japan paper. Signed, lower right. 13 1/8" x 12 5/8" (33.4 x 32 cm). From the edition published for members of the Kunstverein Kassel between 1925 adn 1927. Knesebeck 223/IIIa. 1926. Lithograph on off-white wove paper. Signed, lower right. 16 1/2" x 22" (42 x 56 cm). From the edition published for members of the Kunstverein Leipzig in 1926. Knesebeck 226/b. 1926. Lithograph on white wove paper. 12 1/4" x 8 1/2" (31.1 x 21.6 cm). Knesebeck 230/d. 1928. Lithograph on Velin paper. Signed, lower right, and numbered "N. 21," lower left. 11 1/4" x 7 5/8" (28.5 x 19.3 cm). From the edition of 32 impressions. Knesebeck 241. Daniel Stoll and Sibylle von Heydebrand Collection. 66. 1931. Lithograph on yellowish, heavy, soft wove paper. Signed, lower right. 14 1/2" x 10 1/8" (36.9 x 25.7 cm). Knesebeck 252/IIc. Daniel Stoll and Sibylle von Heydebrand Collection. 1937-38. Bronze with brown patina. 11 1/8" x 10 1/2" (28.3 x 26.7 cm). Cast in 1941 by H. Noack, Berlin, at the artist's request. Private collection. 1941. Lithograph on smooth ivory wove paper. Signed, lower right. 14 1/2" x 15 1/2" (37 x 39.5 cm). Very rare proof; no edition was published. Knesebeck 274. Private collection. Prior to the twentieth century, art’s political grounding was taken for granted. Most European art—religious scenes, portraits and history painting—affirmed the values and legitimacy of the ruling class. As hereditary monarchs came under fire, first in the French Revolution and then in the more widespread but short-lived revolts of 1848, artists gradually lost their aristocratic support base. Painters like David, Ingres and Delacroix embraced the new order, helping shape the myth of modern France as a land of liberty, fraternity and equality. Others assumed a more critical stance. Daumier, whose caricatures at one point landed him in prison, lobbied for greater social justice. Goya, though employed by the Spanish court, created the satirical etching cycle Caprichos and, in response to Napoléon’s aggressive imperialism, the scathing Disasters of War. Egalitarian idealism, coupled with growing social unrest, prompted artists more frequently to depict peasants and workers. Art remained rooted in political realities, but the emphasis shifted. A significant number of artists identified with the forces of reform. The descriptor “avant-garde,” first applied to artists in 1825 by the socialist thinker Olinde Rodrigues, originally had political connotations. Artists, Rodrigues thought, were natural leaders in the struggle to remake society. The modernist stylistic upheavals that swept through Europe at the turn of the last century were not about “art for art’s sake.” Artists were looking for new forms that would give expression to the radically new circumstances of modern life. They wanted to sweep away the stale pictorial and moral conventions of the entrenched bourgeoisie. That modernism could indeed be perceived as a political threat was later affirmed by its suppression under Hitler and Stalin. Käthe Kollwitz (1867-1945) grew up in a family of committed Christian dissidents. Her maternal grandfather, Julius Rupp, was the pastor of an underground Protestant congregation, the Free Society of Königsberg. Hounded by the police, fined and jailed, Rupp taught the future artist to value freedom of conscience over obeisance to the state. Though Kollwitz was not especially religious, she believed in duty, sacrifice and service to a higher cause. She viewed socialism as a secular path to “God’s kingdom on earth”—imagined by her grandfather as a classless society with equality and justice for all. Karl and Konrad Schmidt, the artist’s father and brother, were among the founding members of the German Social Democratic Party. The German socialists supported women’s rights, and therefore Karl Schmidt encouraged his daughter’s professional aspirations. He dreamed she might become an acclaimed history painter. But such an achievement—then the pinnacle of artistic success—was unattainable for a woman. Prohibited from enrolling at the Academy, females were shunted into the lesser areas of creative endeavor—crafts, printmaking, at most landscape or portrait painting. Fearful of competition, men not only restricted women’s career options, but issued lengthy prescriptive pronouncements about the nature of femininity. Women, they opined, lacked the intellect, objectivity and spiritual understanding required to create anything of note; females could best serve the arts as muses. It was perhaps with these ideas in mind that Kollwitz later ascribed her professional persistence to the “masculine” aspects of her character. Propelled by personal preference as well as the available educational opportunities, Kollwitz made her way, through a succession of women’s art schools and private lessons, to printmaking. It was a fortuitous choice, because history painting in the grand tradition was waning, along with the aristocracy. History as a subject, however, could better be depicted in a sequence of prints than in a single painted image. 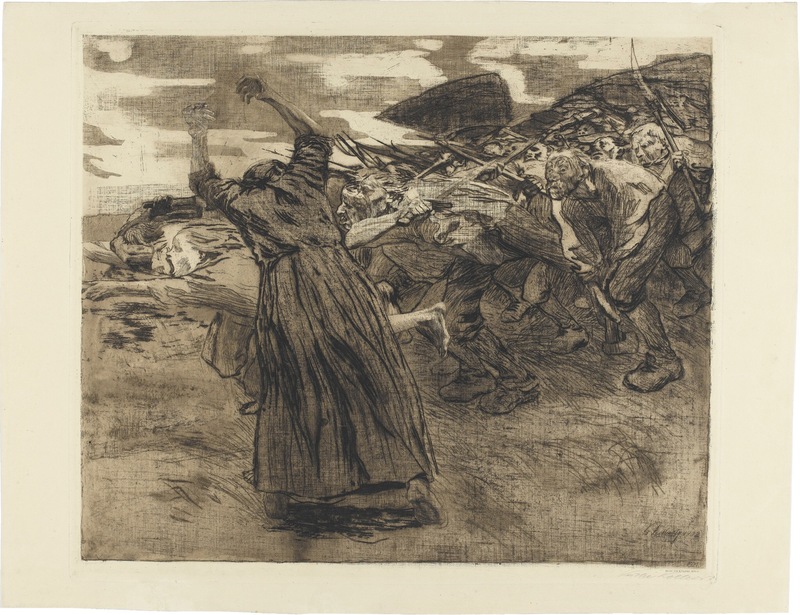 Inspired by the print cycles of Max Klinger, Kollwitz’s first foray in this realm was Revolt of the Weavers, a series of three lithographs and three etchings loosely based on Gerhart Hauptmann’s play about the 1844 Silesian weavers’ rebellion. The Weavers prints (1893-97) evidenced a mastery of craft and nuance heretofore seen only in academic history painting: the orchestration of complex figural groupings and subtle chiaroscuro effects in a variety of evocative pictorial spaces to convey a compelling dramatic narrative. Kollwitz’s intensive engagement with the expressive capabilities of printmaking techniques parallels, and to some extent precedes, the work of modernists such as Edvard Munch and the German Brücke artists, but Kollwitz’s prints were revolutionary less in form than in content. And while for male modernists printmaking was always secondary to work in other, more “important” mediums, for Kollwitz it remained primary. Kollwitz grew increasingly concerned with women’s issues such as inadequate wages, temperance, domestic violence and lack of access to contraception or abortion. After completing the Peasant War series, she took her subjects from lived experience rather than history, and motherhood came to assume a central role in her work. The mother’s instinctual drive to save her children from harm was rendered with an evocative realism that encouraged viewers to empathize with the woman’s plight. At the same time, the images were a symbolic call to action, an invocation to fashion a world that would be safe for future generations. World War I transformed Kollwitz into a committed pacifist. Unlike Otto Dix and George Grosz, whose depictions of the war were conditioned by their army experiences, her War cycle (1921-22) emphasized the home front. In the first plate, The Sacrifice (Das Opfer), a mother holds her infant aloft, as though offering him to the gods. But the German word Opfer also means “victim,” and it is clear that the artist’s interpretation is elegiac rather than heroic. Another plate, The Volunteers, shows a surge of youth heedlessly following the drumbeat of death, Peter’s face recognizable at the forefront. In a 1923 antiwar poster commissioned by the International Federation of Trade Unions and distributed in fourteen languages, Kollwitz focused on the “survivors,” whom she described as “women huddled together in a black lump, protecting their children just as animals do with their own brood.” In 1924, on the tenth anniversary of World War I, she created the iconic poster Never Again War! Kollwitz’s rejection of any fixed ideology did not keep her work from being appropriated for unintended political ends. Even the Nazis, who quickly eliminated all the artist’s professional outlets, found a use for one of her lithographs, Bread! Though Kollwitz was never a Communist, the East Germans made her their own after World War II. In the West, which sought to whitewash the reality of Nazi collusion, she was offered up as the prototypical “good German.” The evident ease with which socially engaged art could be misappropriated for propaganda purposes prompted many artists to back away from politics in the second half of the twentieth century. During the Cold War, U.S. cultural policy willfully discredited any sort of political art. Figurative work was dismissed based on its superficial resemblance to Soviet Socialist Realism. The history of prewar European modernism was rewritten to downplay the artists’ humanistic motivations and oftentimes socialist leanings. The critic Clement Greenberg seconded and advanced Alfred Barr’s formalist approach, which drove the agenda at the Museum of Modern Art. The goal, Greenberg decreed, was to create a work of art xso vacuous that it could not “be reduced in whole or in part to anything not itself.” Lauded for its lack of apparent content, Abstract Expressionism was used by the American government to galvanize intellectual opposition to Communism and to promote the ideal of democratic freedom abroad. As the Cold War example demonstrates, it is remarkably difficult to disentangle even ostensibly apolitical art from the dominant power structure. The art world’s attempt to distance itself from the real world in the mistaken belief that this will keep the work “pure” does not solve the problem of misappropriation. Yet artists today remain torn between a desire to address pressing social concerns such as racism, income inequality and climate change, and the arcane visual language favored by the art world. “There’s... too much inbred art about itself or otherwise so specialized that it takes reams of explaining in almost unreadable texts just to say why it’s relevant at all,” the critic Jerry Saltz wrote in a recent jeremiad. “And the things that might feel relevant, or radical, in another context often get so buffered and wrapped in the wealth of the system...that they cease to offer anything new-seeming.” Genuine political engagement is still fundamentally at odds with contemporary art-world practice. Sue Coe (b. 1951) is not of the art world. As a girl, she assumed she would become a factory worker, like her mother, or a secretary. Art was her escape, at first emotionally and then literally, from a working-class fate. When she was seventeen, Coe got a scholarship to attend the Chelsea School of Art in London, where she trained to be an illustrator. “I knew I had to make a living at art. No one was going to support me except myself,” she recalls. “[Illustration] was one of the few career paths that was open to women: children’s books, or greeting card illustrations, or a job making wallpaper designs (flowers are ‘female’).” In 1972 Coe moved to New York and began doing editorial illustration for The New York Times and similar publications. Designing for the printed page taught the artist to refine her visual messaging. “If the images are not an effective lure,” she explains, “immediately compelling or accessible, the viewer will not consider reading the content.” While then unfamiliar with Klinger’s treatise Painting and Drawing, Coe, like Kollwitz, instinctively understood that black-and-white is better suited to social criticism than color. Coe had developed the first shreds of a political consciousness protesting the Vietnam War as a student in London. “I could see this was a moral stand,” she remembers, “even though at the time I didn’t know Karl from Groucho.” In New York, she joined the Arts Club, a place where aging Marxists, many of them survivors of the Great Depression and the McCarthy-era blacklist, met to discuss politics and print posters in support of local issues like tenants’ rights. She also broadened her aesthetic horizons, discovering the work of Daumier, Dix, Goya, Grosz and, of course, Kollwitz. Free of formalist dogma and its concomitant prescriptions, which still gripped American academia, Coe selected from the broad panoply of art history those influences that spoke to her. Tired of the constraints imposed by her editors, she also began choosing her own subjects and working on a larger scale. For Coe, the predations of capitalism transcend the specifics of identity politics, uniting all socioeconomic minorities in common oppression. Growing up near a slaughterhouse on the outskirts of London, she came to view non-human animals as part of an overriding continuum of corporate violence. “We need economic, gender and species equality,” she declares. Today the sort of widespread hunger depicted by Kollwitz is rarely seen in developed nations. Instead, we suffer from the problems of overproduction, which are subtler and more globally diffuse: malnutrition, the destruction of indigenous crops, deforestation and sweeping environmental degradation. Agribusiness and the meat industry are behind many of these calamities, Coe points out. “Animal agriculture is among the leading causes of climate change,” she says. “Animals as a class of beings are facing extinction.” Coe sees farmed animals as analogous to the children in Kollwitz’s work: innocent creatures trod under by the malevolence of an unjust system; creatures that stand both for themselves and for the future, in that their persecution reflects existential environmental concerns. Rooted in the real world, the art of Käthe Kollwitz and Sue Coe communicates with people in a visual language they understand. Though their styles are very different, both artists combine immediately recognizable representational elements with an expressive abbreviation of form that directly engages the emotions. Kollwitz sometimes spent years refining a single image, trying out variations until she found the most effective synthesis of content and form. “It’s always been a balance of form and content, throughout the history of art,” Coe notes. 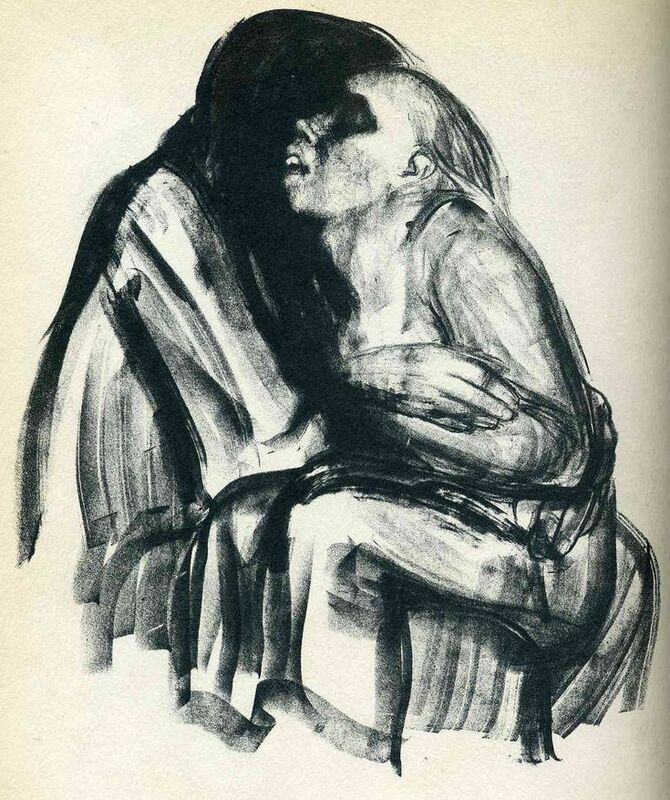 “The work must achieve a level of technique to convince the viewer to look at the sincerity of the content.” “Admittedly, my art is not ‘pure’ art,” Kollwitz declared. “But art nonetheless.” One-hundred-and-fifty years after the older artist’s birth, the magnitude of her accomplishment still resonates, not just with followers like Coe, but with those of us who know we have yet to achieve equality and justice for all. We would like to express our deepest gratitude to Sibylle von Heydebrand and Daniel Stoll for lending so many of their Kollwitz treasures to our exhibition. This show would not have been possible without their cooperation. The Galerie St. Etienne’s exhibition coordinator, Fay Beilis Duftler, also provided invaluable contributions to the project. Copies of Sue Coe’s latest book (her seventh), The Animals’ Vegan Manifesto, (122 pages, 115 black & white illustrations, soft-cover) may be purchased for $17.00, plus $10.00 shipping and handling. New York residents, please add sales tax. Checklist entries are accompanied by their catalogue raisonné numbers, where applicable. Image dimensions are given for prints, full dimensions for all other works.